The bright and lofty home boasted spectacular panoramic views of the ocean and sound but was in need of a modern makeover to keep it feeling relevant and in line with the homeowner’s style and aesthetic. Drawing from her oceanside inspiration, Cheek was able to give it just the update it needed by incorporating a seaside color palette that focused on adding both subtle and bold pops of turquoise, teal and seafoam to bring the outside in. 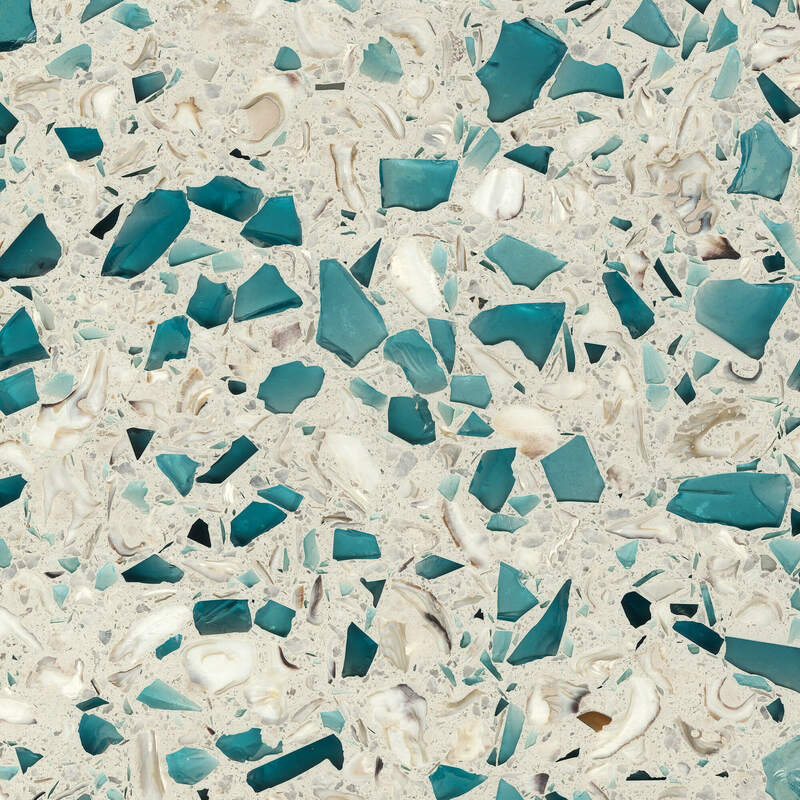 Bretagne Blue, a Vetrazzo recycled glass countertop surface, was just the right mix of coastal colors to top the kitchen and living room bars with the color, light and movement of the ocean. The island home is known affectionately as “The Dream Beach House” by our friend and fellow Vetrazzo-lover, Erin Olson Moser from the blog, House of Turquoise, who dedicated not one but three blog posts to its generous use of colorful blue hues. “Lindsey wanted to pull in and complement the nature that surrounded the home while tying in bright colors that the client requested,” Moser said, and like her, we’re equally in love with this island oasis. “Her expert layering of pattern, texture and color couldn’t be more perfect!” Moser said. We agree. AGM Imports Granite and Marble provided the countertop material for the kitchen and two wet bars fabricated by Sellers Tile and Custom Counters in Wilmington, NC . Thanks to Cheek’s handiwork, the open floor plan of the ground floor’s living room and kitchen area has a bright and airy feeling that combined warm wood details with beautiful blue tones in the sofa, lighting fixtures and even a tiled fireplace. A wet bar with a Bretagne Blue countertop features a complementary backsplash of mint-colored subway tiles and white and glass cabinetry. In the kitchen, the modern coastal color palette of turquoise and white continues on, with Cheek making a few impactful changes to make the space feel totally different. “What’s most inspiring to me is that the designer kept the same cabinets, same appliances, same layout–yet a fresh coat of paint and major updates on finishes and lighting completely transformed the space,” Moser said. The large gourmet kitchen is anchored by a beautiful island/breakfast bar that defines the living and dining areas. Bretagne Blue’s hand-placed architectural and aquarium glass pieces mimic the same colors of the sand and sea sitting just outside. Small pieces of Georgia marble within the surface are like the whitecaps on the ocean. Topping off the home's redesign is the upper level solarium. The tall cathedral ceilings are lined with chestnut-colored wooden planks that feel like the inside of a ship and white walls with floor-to-ceiling windows that make the space feel even larger. The lounge style space features a custom shuffleboard game, turquoise and jewel-toned colors in the rug, sofa and stools, plus another fun wet bar in the corner topped again with recycled glass countertops. Want to style your own sea-inspired space? Order a sample of the Bretagne Blue here. They're free to the trade.